There are pictures and video on our website and Facebook and some video on YouTube, but here are some of the Shrike Mounts system on my FZ07. And one more with the bags off the bike. 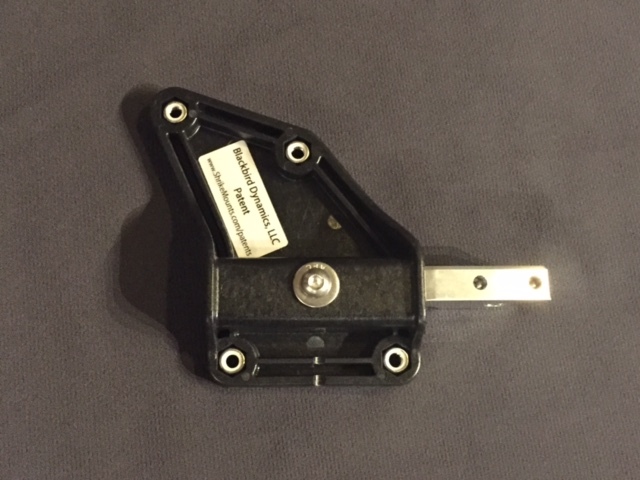 Note that the mounting system looks like a typical passenger peg. That's the only mounting point to the bike. Hello. 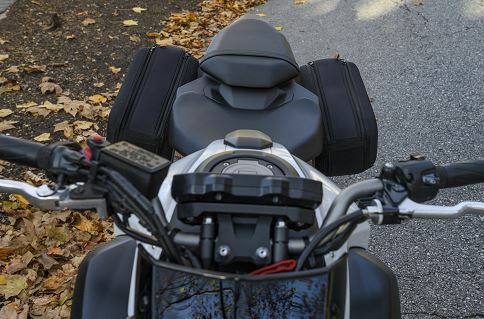 I've gotten some questions about whether or not the Shrike Mounts system can lock the bags to the bike. I'm attaching some pictures to show some possible options. 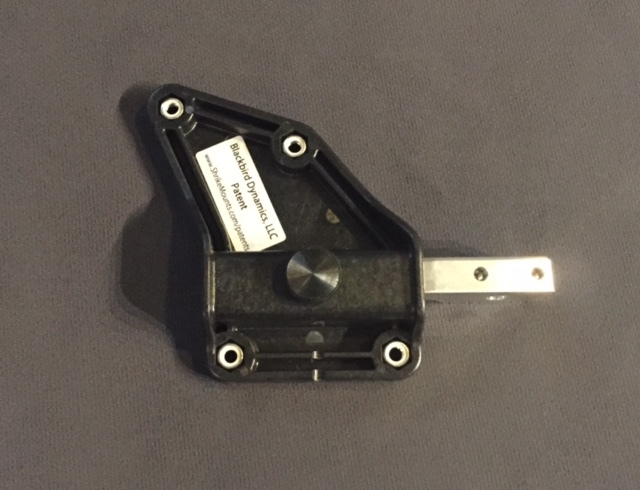 You may note that in some early pictures, the system is attached with a safety pin or hitch pin. Feedback was universal that riders disliked the pins, especially when wearing gloves. Since then, we switched to a threaded knob as the standard mount. 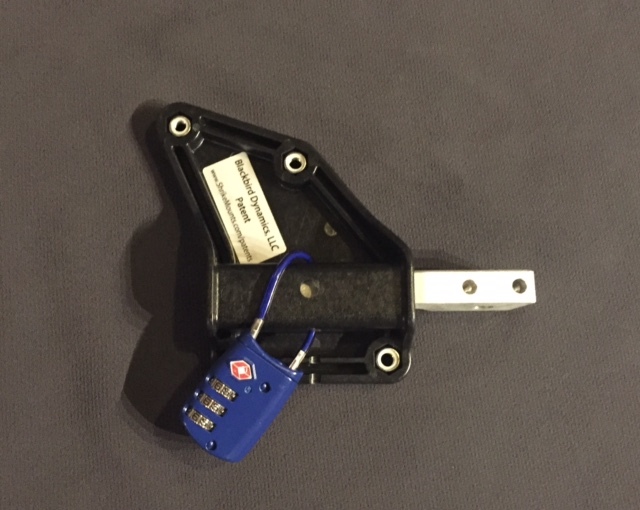 Here's a picture of the receiver locked to the peg. The knob is a standard 6mm thread - so you can essentially bolt the system together using any 6mm fastener. This isn't locked, but is arguably as secure as anything else mounted to your bike with screws or bolts. Finally, I can add an extra hole so that you can use a lock. The hole needs to be small so you don't compromise the strength of the system, which limits your choice of locks to ones like you see in the picture. This isn't a standard feature, so I'll need you to let me know if you want this option. Hi everyone. We had some requests for a video to show how stable the Shrike Mounts system is when loaded up and going down the road. This is a little rough (the system is more stable than the cameraman) so we'll try to get a better video up soon. Let us know if you have questions or suggestions. Here's a view of the stability of the Shrike Mounts mounting system using an action cam mounted directly to the system. (Rather than using my 15 year old as a camera man in the car behind me.) The camera does not have image stabilization and is sticking out almost 6" from the mounting plate, so it is definitely catching the wind. 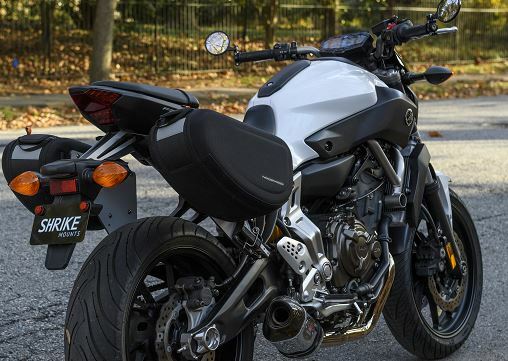 This is the same plate and receiver used for the "low" mount saddlebags for the FZ-07. You can also see how quickly you can remove the bags and swap them for something else. 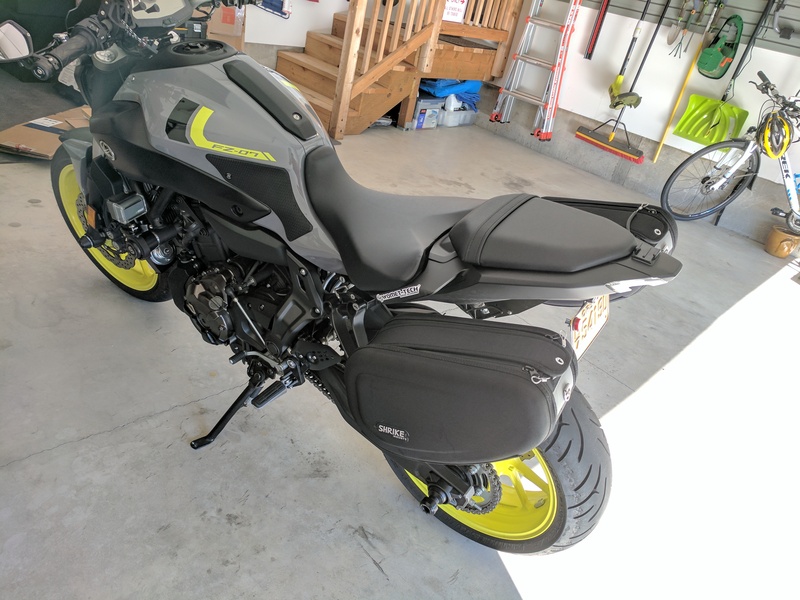 The reviews on this FZ-07 bag mount system and bags are phenomenal! 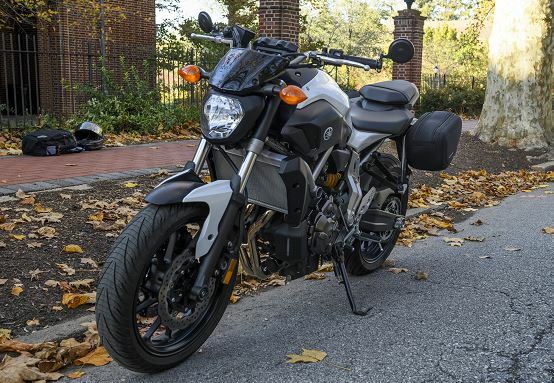 If you commute on your FZ-07, or travel at all, this is the way to go! I need one with a hard case big enough for my helmet. Hi @DewMan. I don't have a bag big enough for your helmet, but I could probably make you a plate with a hook so you could cable lock it to the bike or carry an extra helmet. Would this still fit if we have a Corbin seat? I just received my Shrike saddle bags and I'm very happy with them! I was a little hesitant to put saddle bags on my bike, but I was tired of overloading my backpack. These bags look great on the bike! The shape and position of the bags flows really well with the overall lines...you can tell it was custom made for this bike. 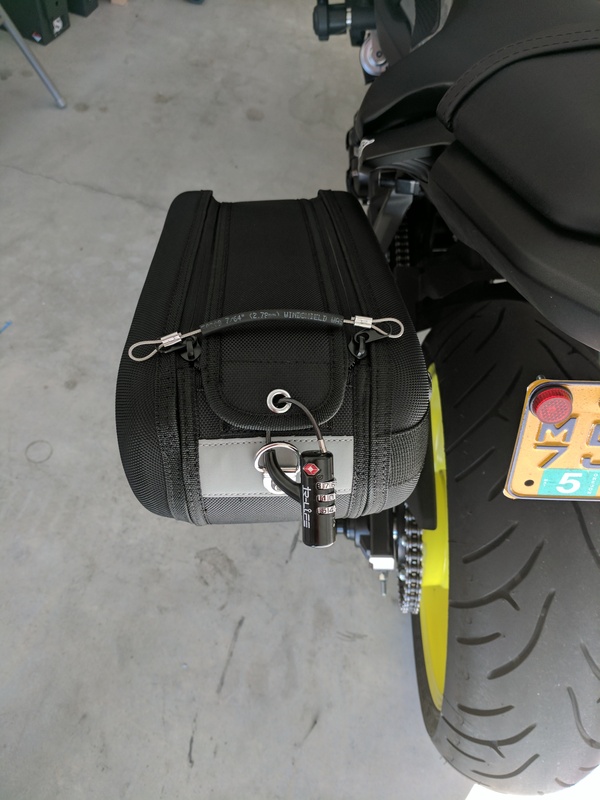 The bags and mounts are very well made and James has thought of all the little details, down to including some metallic tape to protect the finish on the stock foot peg mounts from the set screws. Installation took about 5 minutes...I think it took me longer to remove the c-clip from the stock foot peg. I think I have the first set with the new locking mechanism. It's got a passthrough that allows you to use a luggage lock (see photos). 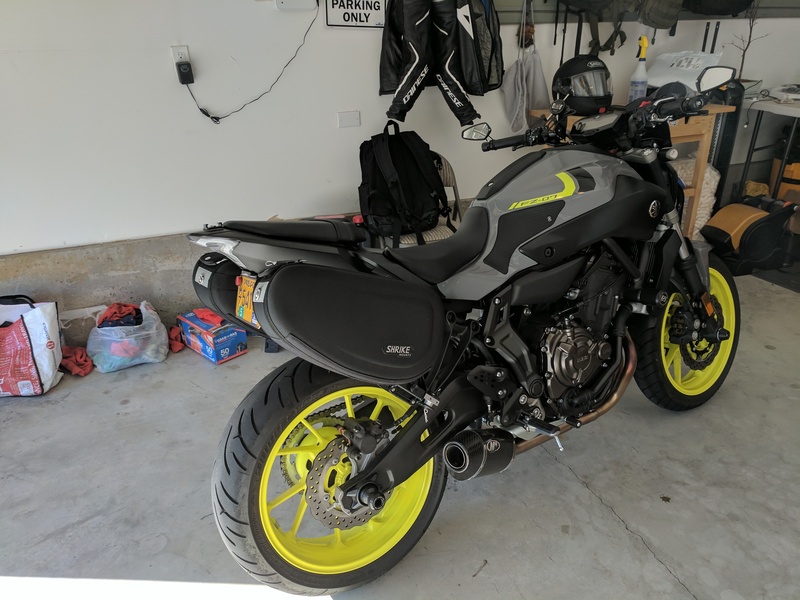 I was planning on taking off the bags when I didn't need them, but they look so natural on the bike that I think I'm going to just leave them on all the time. Thanks for the pics, @myrcode! Nice bike! We're happy that the install was quick and that you're pleased with the look of the mounted system. Yes, you're the first to receive the new locking feature. That option was developed after we received requests for it through this forum. 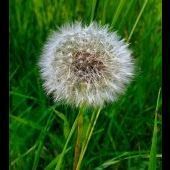 The direct communication at FZ07.org has been great, allowing us to evolve the system to better meet members' needs. 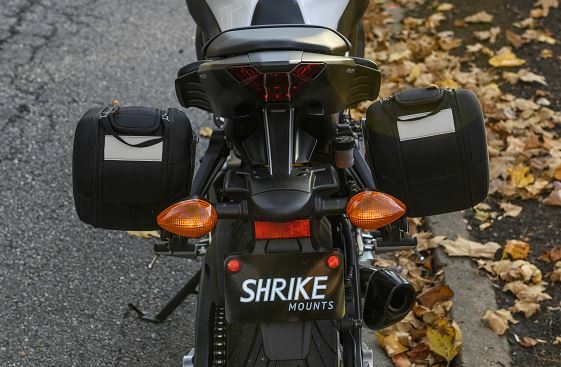 Enjoy your Shrike Mounts luggage system! You might have noticed we went a little quiet here at ShrikeMounts. We listened to your feedback and used it to make some tweaks to our design. Attached is a video showing our updated "low" configuration. This set up will allow you to lock the bags and to lock them to your bike. 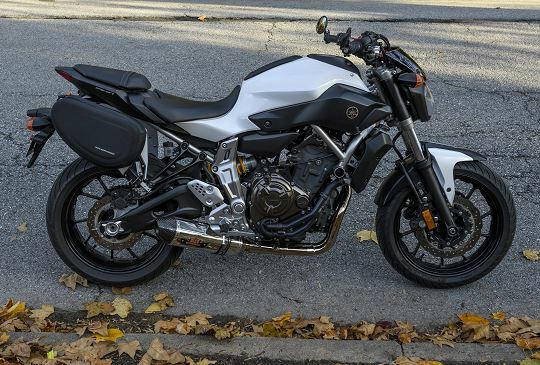 It will also fit any configuration of turn signals/fender eliminators (at least that we've seen to date) and has a few aesthetic improvements as well. Hopefully helps meet your needs. Let us know if you have any questions. Oh yeah - we also worked on fitting the Ninja 300, Ninja 650 and we're working on more models all the time. Feel free to aim your friends who ride our way! Hello again. The locking system for the bags is also available on the high mount bags. 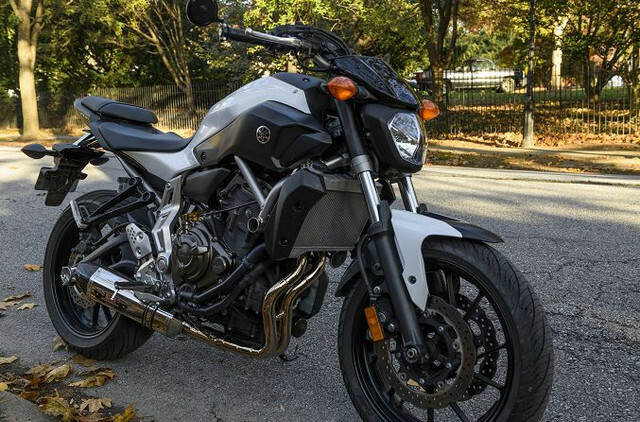 You would have to just use a lock or fastener to lock the system to the bike. This is shown earlier in the thread if you're interested. Hi everyone. We've had lots of requests for larger bags. We don't have a larger bag under our brand, but part of what's nice about the system is the flexibility. Here are some pictures of Nelson Rigg's CL-890 bags mounted on our system. We haven't done a lot of testing with the larger bags yet, but we thought we'd share them here on the forum since folks have asked about it. Deleted the first top view - wrong bag. Problem with hard bags is they break/crack/scratch up way too easily. ADV rider is full of pics of broken hard bags. Lots of choices out there and lots of reasons to choose one system over another. Our system is just an option that really tries to maximize ease of use and minimize the impact on aesthetics. We did have a Ninja 650 customer tell us they had a parking lot fall and the system protected the plastics from damage. He just popped the dents out of the bag and said you couldn't even tell it had been in a fall. We've had a couple of other "crash tests" and other than some road rash the bags and mounting system held up fine. I wouldn't claim they prevent crash damage, but they do hold up pretty well. do you have a set of soft bags that are compatible? Most bags have zilch rigidity in the side walls let alone across the ends to maintain some semblance of shape. Or is the idea that one sandwiches the traditional bag with a 1/4" aluminum plate on the inner wall and the bracket? Neat idea I must say. 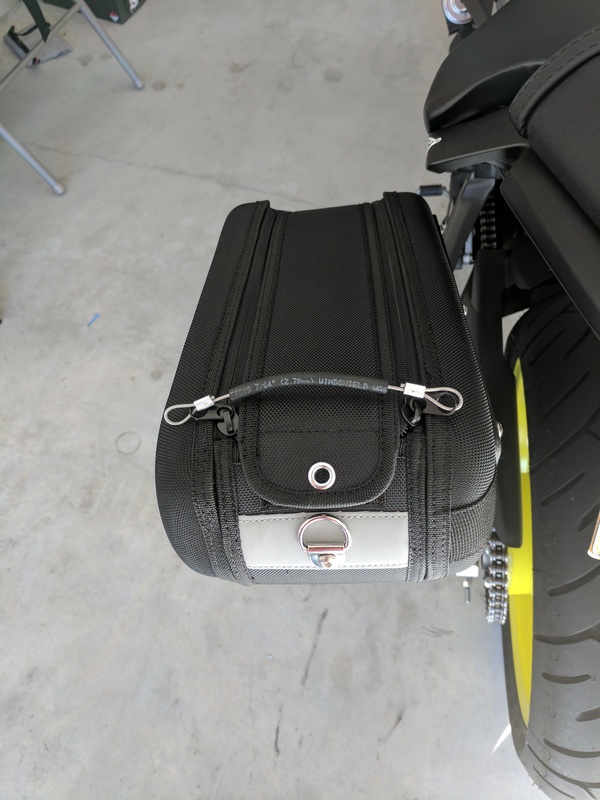 I had Givi 45L bags (old square shape) and they survived a 100+mph get-off. Send all questions to them via their email, as they are hardly ever on the forum. Our standard bags are semi-rigid and have a reinforced section where they mount to the plate. Most soft bags still have a bit of reinforcement where the straps attach to the bags. If someone wants to use their soft bag, we've historically just cut off the straps and mounted the bags to the plate through that reinforced area. The bag "hangs" from the plate the same way it would hang from the strap. If you had a set of bags you wanted to mount to our plates, we could talk you through it pretty easily.